The Peter Rabbit Club. Activity Book Ladybird Ladybird Readers is a graded reading series for English Language Teaching (ELT) markets, designed for children learning English as a foreign or second language. Peter, Benjamin, and Lily are starting a club. They want to have fun! But Mr. Tod, Tommy Brock, and Old Brown want to catch the rabbits. Ladybird Readers is a graded reading series of traditional tales, popular characters, modern stories, and non-fiction, written for young learners of English as a foreign or second language. Recommended for children aged 4+, the five levels of Readers and Activity Books follow the CEFR framework (Pre-A1 to A2) and include language activities that help develop key skills and provide preparation for the Cambridge English: Young Learners (YLE) Starters, Movers and Flyers exams. This Level 2 Activity Book is A1 in the CEFR framework and supports YLE Movers exams. The activities encourage children to practice short sentences containing a maximum of two clauses, introducing the past tense and some simple adverbs. 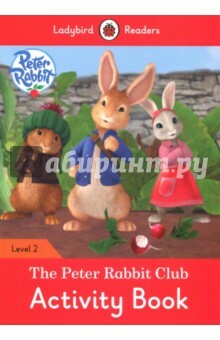 Аннотация к книге "The Peter Rabbit Club. Activity Book"
Peter, Benjamin, and Lily are starting a club. They want to have fun! But Mr. Tod, Tommy Brock, and Old Brown want to catch the rabbits. –20 % Выгода 45 ₽ Sports Day. Activity Book. Level 2 1 рец. –20 % Выгода 45 ₽ Dinosaurs. Activity Book. Level 2 1 рец. –20 % Выгода 45 ₽ The Gingerbread Man. Activity Book. Level 2 1 рец. Похожие на "The Peter Rabbit Club. Activity Book"
Если вы обнаружили ошибку в описании книги "The Peter Rabbit Club. Activity Book" (автор Catrin Morris), пишите об этом в сообщении об ошибке. Спасибо!